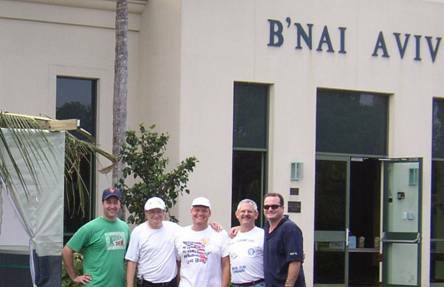 This organization provides the forum wherein men who are synagogue members, expand their horizons by working in fellowship to create exciting programs and events for B’nai Aviv. In so doing, friendships – both personal and business are formed and nurtured. Our main objective is to have fun! We encourage participation in all activities. Come and join us in any or all of our events. Feel free to drop by each and every Sunday morning for a “Prayer and a Schmear” for our now famous weekly Learner’s Minyan and bagel breakfast. Other activities include attending sporting events, participating in softball, Yom Hashoah programs, father/child events, golf tournaments and an annual Saturday night special. In addition, Men’s Club works closely with other B’nai Aviv organizations to enhance and support fundraising and various functions of our synagogue.